⌚Replaceable Watchband:Standard watchband with width of 22mm,which can be changed at will and mached fashionably and freely. Sleep Monitor:With the smart bracelet can count your falling asleep,walking up,and awaking duration time.automatically tracks your sleep duration and sleep quality at the night. ♥Heart Rate&Blood Pressure:Touch the bottom screen on the fitness watch to start monitor,After monitor on the back of the watch light up ,the heart rate and blood pressure monitor start work. Reminders:Remind call,some app daily notifications ,never miss calling and messages. ❗Sedentary Reminder: automatically reminds you to walk or exercise after long time sitting. ⏰Time Format:The wristband support 12/24 hour format and more convenient for you to check time at anytime anywhere. Comfortable&Adjustable:The wristband is adjustable, you can adjust it to fit your wrist. ⌚️2018 Edition Smart Watch: 1.3" IPS LCD full touch screen,which you can see the display clearly even in the glare.New design with MTK2502 CPU,support Android&iOS.Top-grade Metal dial & fashion appearance,double-color watch strap is made of sturdy and soft silicone,comfortable wearing, best companion in daily time! Heart Rate & Blood Pressure Monitor Smart Watch: The activity fitness tracker can be used to track your daily heart rate & blood pressure, accurately record all-day activities like steps, distance, calories burned, active minutes and sleep status helping you adjust yourself for a healthier lifestyle.It's good for you to disease the risk of cardiovascular to know to the fatigue.It can work independently,even though disconnecting app. 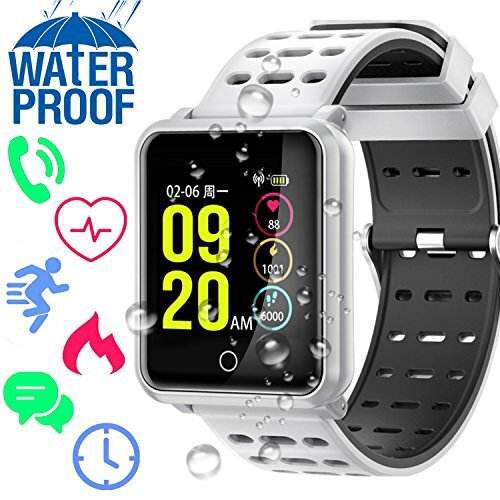 ‍IP68 Deep Waterproof Wrist Watch: Our sports fitness tracker with international deep waterproof and dustproof level,It is not necessary to remove it when splashing rain, sweator,DIVING,SWIMMING,washing your hands or washing others everyday life,perfect for sports& outdoor lover.NOTES:Please DO NOT wear it when taking a hot shower because hot water and steam will cause expension. Bluetooth 4.2 Tech: New CPU compatible Bluetooth 4.2. The smartwatch connect seamlessly with iPhone, iPad, Samsung Galaxy/Note, Sony, Motorola, LG, tablets and other Bluetooth enabled devices. After connecting Bluetooth the APP will sync(Twitter, Facebook, Whatsapp SMS) messages. You even no need taking out your phone from pocket or bag and will never miss a call or message.